"We can detect more cancer that way (through 3D breast imaging) and we can decrease call back rate." 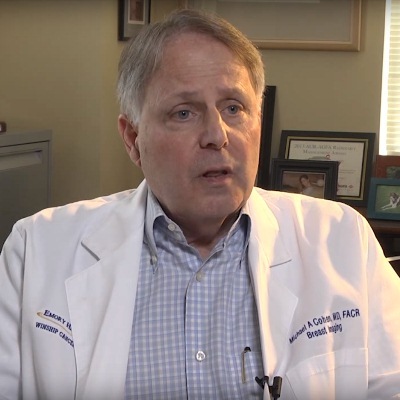 As Dr. Michael Cohen, Director of Breast Imaging for Emory Healthcare, explains in the video, a 3D breast imaging technique called tomosynthesis has proven to be more accurate than conventional mammography at detecting breast cancers, and it produces fewer false-positives that result in patient call-backs for additional testing. Conventional mammography displays the breast in a single, flat 2D image; during a 3D mammogram, X-ray equipment sweeps across the breast in an arc taking multiple low-dose images of the tissue. A high-powered computer then converts the images of the breast into very thin layers creating a three-dimensional view. The 3D exam takes only a few seconds longer than the 2D mammogram, but requires no additional compression of the breast. This technique has proven to be more accurate and has fewer false positives than conventional mammography. To learn more about breast cancer care at the Glenn Family Breast Center at Winship Cancer Institute, visit winshipcancer.emory.edu/breast-cancer.